It seems our book-keeping leaves something to be desired: we missed Mary Damiano's review of Knish Alley, and Brandon Thorp's review of the Caldwell's Vices. This doesn't alter the end result: Hap still reviewed more shows than anyone else. And just a reminder: each review only counts once: I don't count re-prints. We included a total of 8 shows in our July tally: we specifically excluded tours and shows in foreign languages, as well as single-performance and "academic" productions. We have kept it to the mainstream, so that all the papers can be compared on something approaching a level playing field. We also excluded reviews not written by a recognized theatre critic; this means that Rod Stafford Hagwood is excluded from the tally: he is not a theatre reviewer. We did mark the shows he wrote about, they just don't figure in the tally. 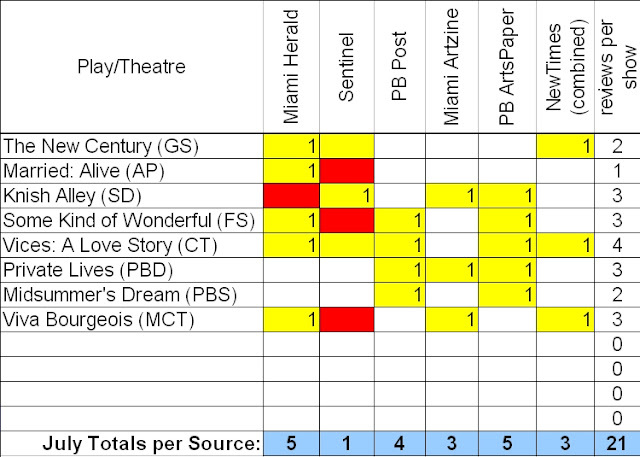 The 8 shows included in the tally recieved a total of 19 21 reviews, or an average of 2.3 2.6 reviews each. Blocks marked in red indicate shows that the source declined to review, choosing to reprint a review from one of the other sources in the tally. Out of the 8 qualifying shows that opened in the month of July, The Miami Herald and Pam Beach ArtsPaper each reviewed 5 of the shows. For the Herald, Christine Dolen wrote 4 of those reviews, with Bill Hirschman brought in to cover one show while she's on vacation. That means that readers have been deprived of Dolen's take on Mad Cat's Viva Bourgeois. The Sun-Sentinel had a dismal showing this month, producing only one actual theatre review, (Bill Hirschman's review of Knish Alley) although they did send their fashion editor out to two shows. We don't know why. The articles were neither informative nor well-written. 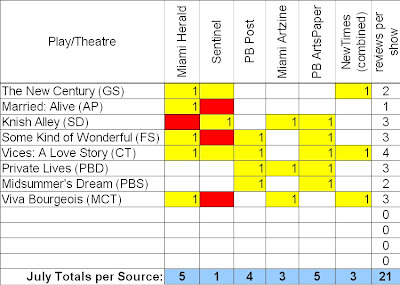 Only one journalist reviewed more plays than any other, seeing five of the eight productions; therefore Hap Erstein of the Palm Beach ArtsPaper is the South Florida Theatre Scene's Outstanding Critic for July, 2009. OOPS! Yes, you did! How'd I miss that? Sorry, B. I'll update it this evening; I don't have access to that file right now.